Phrases from this movie a long time ago, has become a popular and online roam thousands of movies of this picture. 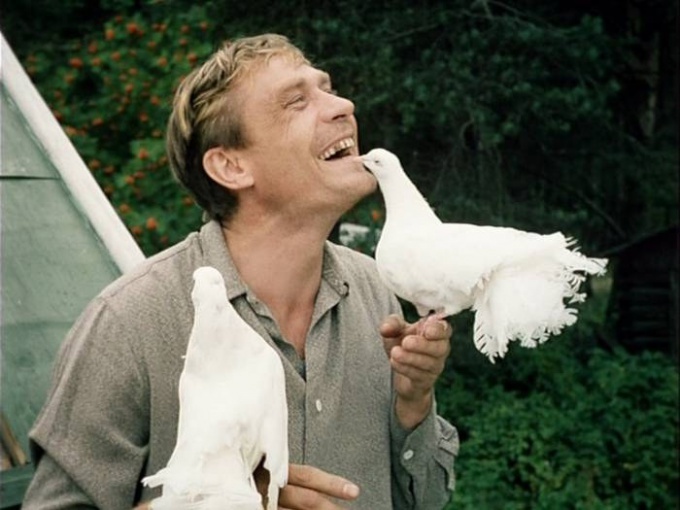 Hard to imagine what would be distinctive of the treasure would have lost our cinema, if Vladimir Menshov did not remove the "Love and pigeons" in 1984. The script for the film "Love and doves" was written by Vladimir Gurkin, actor, screenwriter and playwright. Interestingly, all characters have real prototypes, all the paintings of scenario occurred in real life. The fact that the family Kusakina is neighbors family Gorkinym in the village of Cheremkhovo. The characters Nadia and Bob were charged to the grandparents of Vladimir, the sister of the grandmother is Baba Shura, the grandfather of actor – uncle Mitya, and Raisa Zakharovna his classmate (according to some). The Director himself was surprised at how bad live villagers, he was looking for a kind more or less suitable for the screen to be seen a lamentable decline. The nature of the film Vladimir Menshov was looking for a long time, I had to go to many villages to find a suitable one. Perfect pictures of nature and rural life have been found in Karelia, on the outskirts of Medvezhegorsk, on the shore of the river Kums. There was destined to play Doroshina Nina and Alexander Mikhailov. However, in order to start shooting, we had to Refine the shot for the main characters house. The crew independently onto the veranda and loft. Currently part of the buildings have already been destroyed, including the local house of culture, which took place in the story of the dance. Even the family home Kusakina demolished, now in its place stands the mansion. According to the scenario after the injury Basil direct to the resort, on the sea to heal. However, the place of rest is not known. In 2011, in the village of Cheremkhovo was a monument to the main characters, the author – sculptor Karim Mukhamadiev. Resort the shooting took place on the territory of Georgia. Episode swimming and meeting Basil and Raisa rice Zakharovna loved was shot in Batumi in November, the water temperature at that time was just above fourteen degrees. Some additional points were still shot in the local dolphinariums in the outdoor pool. Episode the fall of Basil from the doorway into the sea was shot three times. The idea of the Director, the character was supposed to fall into the sea, under water stripped divers, and in a moment he had to swim to Raisa Zakharovna. During filming the second take, the actor almost drowned because of the tie, which did not want to come loose. In the end, a tie strengthened by only a few stitches to quickly disrupt. Also in the frame were the Batumi beach and a local market, where Basil and Raisa made a purchase, and the balcony scene was filmed in the hotel "Batumi address". Other scenes were filmed in pavilions "Mosfilm".